If you and your mates are planning on celebrating this St Patricks Day, do so in style in these Leprechaun Fancy Dress Costumes. And you'll quickly understand the old adage "the luck of the Irish", as for a limited time only, if you buy two of these St Patrick's Day outfits, you'll get the third one absolutely free. These Irish themed fancy dress costumes include an all-in-one leprechaun jumpsuit comprising of a pair of green trousers with a yellow trim, a coordinating vest, a green jacket with a yellow trim and gold shamrock detailing and a pair of black boot tops. The waist is shaped with a hoop to create a rounded figure. 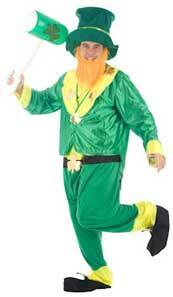 The leprechaun costume is completed by a matching green hat with a gold shamrock trim and a ginger beard! This is a one size costume designed to fit jacket / chest size up to 42".